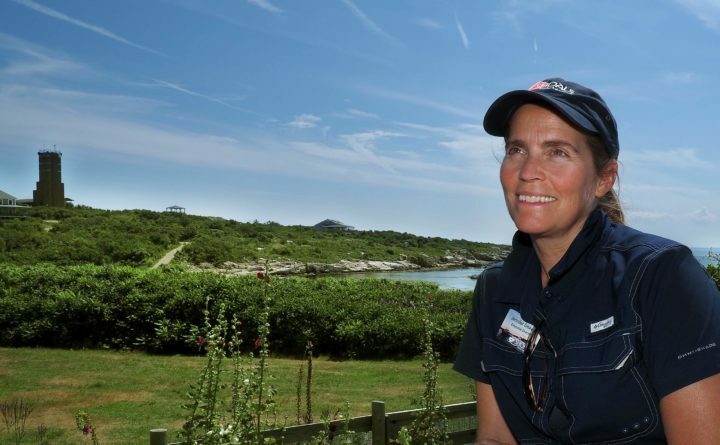 Jennifer Seavey, executive director of the Shoals Marine Laboratory on Appledore Island, talks about a new program on the island where researchers are looking into the effects of plastic pollution on seabirds. 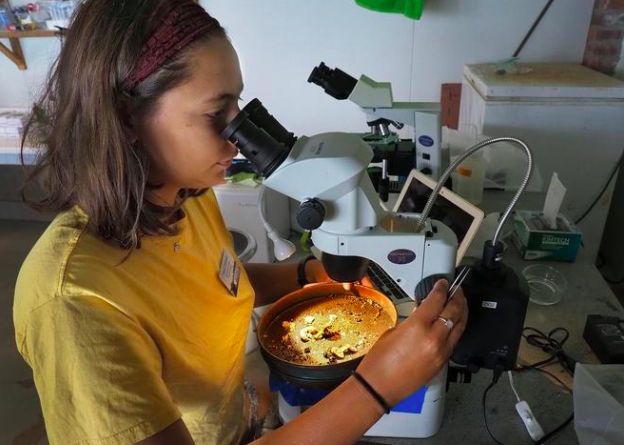 Aliya Caldwell, a student at Rutgers University in New Jersey, is an intern studying seabirds and plastic pollution this summer at the Shoals Marine Laboratory on Appledore Island. APPLEDORE ISLAND, Maine — For years, undergraduate student interns and their faculty mentors at the Shoals Marine Laboratory have been monitoring and researching tern and seagull populations at the Isles of Shoals. Lately, though, they have noted a disturbing trend — an increasing introduction of plastic in the birds’ ecology: hard plastic, polystyrene, fishing line, fibers and, the most ubiquitous of all, small pieces of single-use plastic bags. As a result, the Shoals Marine Laboratory this summer is embarking on a pilot project to begin to quantify the amount and type of plastic found in the environments of herring and black-backed gulls on Appledore Island, and common and roseate terns on Seavey and White Islands. It will be a multi-year study that will build on the information garnered by student scientists each summer, with the goal of being able to add to what is now a small but increasingly recognized dataset on the effects of plastics in seabirds. And it’s important information to gather, she said. New Hampshire has declared the common tern a threatened species, and roseate terns are federally endangered. Even populations of the ever-present seagulls are diminishing in the Gulf of Maine. It is estimated that in almost 700 marine species, plastic is a factor. By 2050, 99 percent of seabird species and 95 percent of all bird species will have ingested plastic, Seavey said. What are the implications of this plastic ingestion? That is one question in a virtual ocean of questions that are being raised through the Seabird and Plastic Pollution Internship. “There’s mostly anecdotal information now. And there are not many researchers in the Gulf of Maine studying this. So in that sense, we will be contributing to that story significantly here. Because we know they’re ingesting it,” said Seavey. Aliya Caldwell, who will be entering her junior year at Rutgers University in ecology evolution and natural resources, was selected from among 20 or so applicants as the research intern for this inaugural season of the study. The internship is among eight for undergraduate students offered at the Shoals Marine Laboratory this summer. Others are studying parasite ecology in green crabs, intertidal ecology, gull population biology, and aquatic ecology. All are paid a weekly stipend and are provided with room and board. Separately, engineering students come every summer to learn about the engineering challenges of supplying power and water to an island. This year, a sustainability communications internship was also offered. So, for instance, gull and tern guano would be a logical substance in which to measure plastic ingestion, but the size would be at the microplastic level. Polystyrene is an example of a plastic that quickly breaks down into microplastics, she said. “It could be good that we’re finding it in the pellets. That may mean they are not accumulating it in their bodies,” said Caldwell. The actual plastic itself attracts not only biological material but toxins in the ocean, said Seavey. Biological material like algae and kelp basically adheres to the plastic, over time forming a coating. Seabirds that don’t ever come ashore, like the albatross, are dying from plastic ingestion because they see something like a kelp mass that has a core of plastic, she said. In addition, plastic also attracts toxins like pesticides in the ocean, and the plastic itself has estrogen mimickers, which could have long-term impacts on the birds. Caldwell said she is finding the most evidence of plastic in the pellets she collects. She breaks the pellets up and puts the material in a 1mm mesh strainer, then washes out all the micro-elements and studies what remains under a microscope. To date she’s found fragments of hard plastic such as from a tool or appliance, fishing line, fibers from items such as clothing, polystyrene and “nurdles” -tiny balls of plastic that serve as the raw material to manufacture items. Seavey said there have been several “famous” nurdle disasters at sea, where a shipping container filled with them falls off a ship and spill their contents. But by far the most prevalent plastic is from single-use bags, said Caldwell. For another, herring gulls, well studied for their forays to landfills, are ingesting more plastic that black-backed gulls. There’s not as much research on black-backed gulls, said Caldwell, so this line of inquiry would be worthwhile to explore in future years. Seavey and Liz Craig, the tern conservation program manager for the Shoals Marine Lab and the second mentor on the project, will sift through the data collected by Caldwell over the winter, “just to make sure there aren’t any messages we missed,” said Seavey. And Seavey will also likely look for a sterile lab partner, and the funding to contract with the lab, as well. As the work continues, who knows what questions will crop up, she said. “Say, Portsmouth adopts a plastic bag ban. York already has one. And before long you start seeing a decline. That would be fabulous. How long should we be monitoring? Five years, ten years? Once researchers have a uniform methodology, things could move quickly,” said Seavey. And once there’s data to share, she said, the public can be sure she will share it with people on the mainland in addition to other scientists, to inform their decisions on the use of plastics.